The stylish English Football Captain maybe out of the upcoming World cup owing to an Achilles tendon injury but you can’t keep him away from the action which he’ll be keeping alive by teaming up with Yahoo this summer. Yahoo will be offering exclusive content in its Football WC coverage and also for the 2010/2011 Football season. The internet giant will be launching a ‘David Beckham channel’ on Yahoo sports and the Footballer will appear in the Company’s integrated marketing campaigns for specific Yahoo products and services, throughout the duration of the World Cup in select markets. Yahoo said in a press release that the aim was “to drive more people to search, use and talk about Yahoo! through exciting and experiential demonstrations of our unique ability to bring the world together”. The Star player also appears to be excited in being able to stay connected with his beloved game while he’s forced to watch from the side lines. “Yahoo! will allow me to interact one on one with as many football fans as possible talking about the game I love,” Beckham said in a statement. 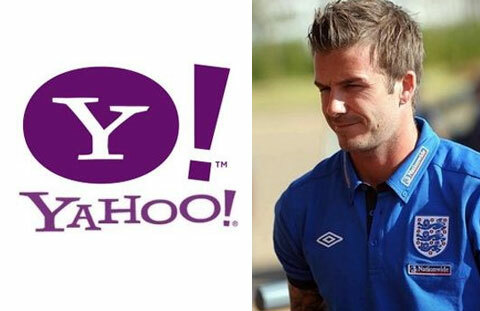 Fans will be able to interact directly with Beckham and ask him questions through various Yahoo! channels, including Yahoo! Answers, Y!Mail and Y!Messenger. Next post: Is Social Networking the New Google?